Situated on a preeminent oversized lot on the NW corner of Oak St. and Galena Ave., 301 N. Oak is an iconic Victorian, originally built in 1900 and exquisitely remodeled in 2008 and again in 2018. The elegant new remodel includes a completely updated gourmet kitchen, living room, dining room, guest bath on main level, guest bath on second level, plus master bath. 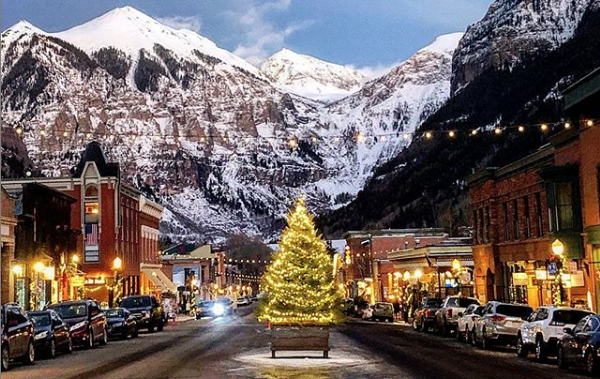 In addition, the garage has been remodeled to accommodate a full-size Suburban plus an additional covered parking space, which provide two coveted covered parking spaces, rare for Telluride. Enjoy extraordinary ski area and Ballard views plus box canyon alpenglow from the spacious south facing deck. One of Aspen Ridge's finest townhomes, this optimal corner unit provides magnificent views of the Sneffels Range and Wilson Peak. Exquisitely furnished with 4 bedrooms and 4.5 baths, you will enjoy the utmost convenience in Mountain Village with easy ski access, short walks to the shops and restaurants of the gondola plaza plus a short stroll to the Mountain Village golf course driving range. Located on the northeast corner of the complex, Aspen Ridge 17 lives like a private home amongst the treetops. Monday, December 3, 2018 - With favorable snowmaking conditions and 20 inches of snowfall in the past 5 days Telluride Ski Resort has announced new terrain in the Lift 5 / Polar Queen area will open for the season on Tuesday December 4th. Terrain Details: A majority of the terrain in this area will be open including Polar Queen. Steve and his executive assistant, Anna Henderson, are thrilled to welcome Ellen Williamson to their team, officially bringing "Team [Chet-chu]" into fruition. Ellen brings a deep understanding of high-touch, personalized service and marketing savvy that further compliments this highly successful duo. Since 2014, Ellen Williamson has taken part in over $165,000,000 in real estate sales transactions and over $400,000,000 in listing presentations, acquisitions, marketing, management and showings. Relationships are at the core of Ellen’s success. Prioritizing sincerity with open and honest communication complemented with equally being an attentive listener, Ellen has emerged among the top in the Telluride market.